Newly built beautifully modern spacious contemporary designed two bedroom two bathroom ground floor apartment (sleeps 4/5 the apartment will comfortably sleep 4 adults and 1 infant in a cot bed) with huge private outdoor terraced area. Fully air conditioned/heated with plenty of parking. Free Wifi and Satellite TV. The property also has ceiling fans in main living space and master bedroom and second bedroom for additional ventilation in the summer months. Situated on a Jack Nicklaus 18 hole signature golf course within the exclusive Mar Menor Golf and Spa Resort on the beautiful Costa Calida with year round sunshine. The property benefits from being just a 3 minute walk to all golf facilities, clubhouse, bars and restaurants and Spa facilities. There are nine restaurants and three bars on site. The beautiful Mar Menor Sea and its stunning beaches, beach bars and restaurants are just a 5 min drive. The typically Spanish beach town of Los Alcazares is less than 5km away with numerous Restaurants, Excellent Tapas, Beach Bars, Water sports and shops. This outstanding property will suits golfers, families, young children (Cot and High Chair supplied FOC) and couples alike. The apartment has everything you require to ensure you have a wonderful and relaxing holiday. A free bus operates to beaches and local towns in peak season and taxi's are available year round. Please note there is no microwave in the kitchen. I live in the United Kingdom with my husband and young son and after travelling extensively now spend most of our holiday time in Spain. We love spending time at our apartment in Spain when ever our work schedule permits. The property is situated in one of the best locations within Mar Menor Golf and Spa resort, affording you privacy and security whilst benefiting from huge outdoor living areas, large pool and just five minute walk to all the amenities inc. Golf, driving range, clubhouse, gym, award winning spa, numerous bars, numerous restaurants, supermarket and residents communal pool and pool bars. The town of Los Alcazares and the Mar Menor Sea are just a five minute drive away with the beach, beach bars and restaurants. 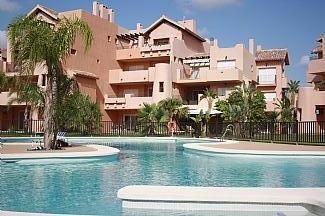 We purchased this property in early 2011 after having enjoyed numerous holidays at Mar Menor over the past years. The outstanding scenery and location make it perfect for golfers, families and couples alike. The outstanding climate with an average 340 days of sunshine per year make it the perfect get away from the typical British summers. You can enjoy all the benefits of this fantastic modern resort with it's Golf, Spa and restaurants or drive to the local town of Los Alcazares to enjoy the beach, bars and restaurants serving snacks to beautiful local seafood and typical Spanish dishes from tapas to paella. The property is ideally reached with flights from the UK to Alicante or San Javier airport. New, modern, comfortable & just a short stroll (3 mins) to all facilities, situated in beautiful gardens and just twenty feet from your large pool. This property benefits from having one of the largest terraces on the resort. The terrace receives the sun from 11am to sunset so is perfect for sunbathing and eating alfresco. Being on the ground floor is perfect for those with young children. Families -Having a young son we have ensured the property is convenient for families so a travel cot & high chair are supplied and the pool is gated for security purposes. The property has free wifi and satellite TV showing both UK and International Channels. Golfers - Great location overlooking the water feature and 13th and 14th holes and less than 3 min walk to driving range, buggies and clubhouse. Tuition can be arranged from the club house. Needing pampered? - You are a 5 minute walk from the fabulous 5 Star ESPA who offer a huge range of treatments at reasonable price. You have numerous on site restaurants including Spanish, Italian, Sushi, International, American Diner, Steak House (BBQ), Indian and Bar Meals. Contemporary lounge with huge comfy sofa&chaise, 32'Plasma HDTV iPod dock DVD player & DVDs. Lounge access to huge terrace, great view to golf course lake and stunning sunsets. Dining area has table, four chairs for eating indoor should the notion arise. Located on a fabulous Jack Nicklaus 18 hole signature course, golf views with the terrace over looking the lake and the 14th Green & 15th Tee. Yet only five minute walk to clubhouse, buggies and practice range. Three other fantastic courses at Hacienda Riquelme, La torre and El Valle are all within easy reach being just a 15 minute drive. Mar Menor has featured many events, motorised buggies, tuition, driving range and practice greens are all on site. Staying at Mar Menor Golf resort allows you the opportunity to partake in the Jack Nicklaus Great Bear Golf Trail due to the numerous courses available within easy reach. Ground floor apartment with excellent access to all amenities, golf, restaurants, bars, shops and pools. Pool is twenty feet from terrace and is fully fenced off for child safety. A separate toddlers pool is located adjacent to main pool. The indoor pool is situated at the hotel and this is the only pool which is heated. Notes on accommodation: New outstanding, modern, newly furnished apartment with fantastic facilities to ensure all your holiday needs are met. Apartment sleeps 4 adults in 1 double and 1 twin room. master bedroom ensuite (a travel cot is supplied for babies and a camp bed can be made available for small children). Outside: Benefit from one of the best locations on the resort being situated just a five minute walk to all amenities including golf, drive range, club house, well stocked supermarket, bars, spa and numerous restaurants. The property features a huge terrace with modern contemporary eating and seating facilities just 20 feet from large swimming pool. Sun loungers are provided to enjoy the sun all day (11am to sunset). A second terrace is accessed from bedroom two. The pool is fully enclosed for child safety and perfect for cooling down or exercising. Relax in the landscaped gardens and communal grass areas to enjoy the beautiful surroundings and views over the lake 14th hole and 15th Tee. Mar Menor Golf resort has everything you will need, set within beautiful gardens and golf facilities and has security guard entry. Cleaning / Towels / Linen / Maid service: Property will be fully cleaned and prepared prior to your arrival (a welcome food pack can be arranged for your convenience).Towels and linen incl.Mid stay cleans and linen changes can be arranged at additional cost. Other: A second private terrace is located off bedroom two. We found the apartment to be a ‘home from home’. Everything you required was there, and more. We thoroughly enjoyed our stay and will certainly be venturing back. Thanks Bee. apartment was fine but could do with a few improvements,nowhere to keep soap and shampoo in shower room and also no shelves to store toiletries in same room only place to put items is on floor also a micro oven would be very handy,on last night we were there we had a lot of ants in the kitchen area. Thanks for the feedback Raymond. Our advert expressly states that the apartment does not have a microwave from the outset. Apologies about the ants on your last night. This tends to happen in Spain is when food is left in the open or if crumbs and food particles are left on the floor and surface areas. Delighted you enjoyed the rest of yous stay. Beautifully presented apartment. Very large terrace and everything is as stated. Modern and stylish, tastefully furnished and very clean and close to all amenities. When you come out of your front door turn right and cross the road then head left alongside the driving range and you are at the golf clubhouse, the hotel and the clover Irish bar plus a few restaurants just round the corner it’s just 5 minute walk. I will definitely be staying here again. December 16th and I’m sun bathing - brilliant. Bee was fantastic throughout the whole booking process and even advised us where to go when we got here. You’ll love it here. We loved the Italian restaurant too. My family (2 adults, 2 children), stayed in this wonderful apartment for 17 nights. It contained everything you needed, right down to the last teaspoon! Bright, spacious, large patio leading right to the gated pool, which is right outside! There was a tv, dvd player & numerous dvd's for both adults & children. There were a few books and some children's toys - the scooter was especially a hit with my girls! The apartment is about 4-5 min walk from the hotel & bars/restaurants, or about 15 min walk to the Boulevard on the outside of the complex. This was our 3 visit to the resort - always in different apartments. This was by far the best and the one we will now stick with. Fantastic appartment with easy access to pool ! Was extremely impressed with the overall appartment .The decor was exceptional and finished to a high standard. Having an en suite bathroom in the master bedroom was brilliant and the 2nd bedroom had a lovely quiet terrace which gets the sun in the morning. Kitchen was well equipped and had everything we needed for our stay. The beds were very comfortable and furnishings very tasteful and functional. The Golf club house is within easy walking distance and food is excellent. We used the Soa facilities which were extremely well maintained and staff very professional. Really loved my break and can definitely recommend this appartment ! We stayed at a superb ground floor apartment overlooking a wonderful lake and the communal pool was just metres away. Thanks Deborah & Paul for your wonderful review! We are delighted you both a fabulous time! We would love to welcome you back anytime! Thanks again for choosing our apartment for Paul's special birthday getaway! In peak season an onsite daily kids club offers adults some free time to relax, An open air cinema club often operates in the evenings. Beaches at Loz Alcazares and Los Narejos are less than ten minutes drive. Beaches have sunbeds/parasols available and feature numerous beachbars and restaurants. The beaches at San Javier is less than 10 minute drive. Regular flights from many UK to Murcia (San Javier) which is less than 10 minutes drive from resort. Numerous daily flights from UK to Alicante which is approx 60 min drive. Airport collections and transfers can be arranged at reasonable cost. Local car hire is available at both airports. Torre Pacheco, a typicaly Spanish town, features many shops & restaurants is only 3km. San Javier is approx 10km. Murcia City is a 40 min drive. The property benefits from being just a five minute walk to all golf facilities, club house, Spa Facilities, bars and restaurants. The beautiful Mar Menor Sea with its famously healing waters and its stunning beaches, beach bars and restaurants are approx 5 min drive. The typically Spanish towns of Torre Pacheco and Los Alcazares are just 5km away. This outstanding property will suits golfers, families with older and young children and couples alike. A relaxing break to an active outdoor holiday, you will not be disappionted! Booking Notes: Please contact owner for booking details. A deposit of £200 is required at time of booking to secure your reservation. Balance due 8 weeks before arrival. Please note the cleaning fee of 70 euros is payable to the property manager before departure. If not left this will be deducted from the £200 booking deposit to cover the costs. Changeover Day: We always aim to be flexible and ensure the apartment is available.Please contact owner for changeover day details. Notes on prices: Prices from £300 per week, shorter breaks can be arranged with the owner. A security deposit of £200 is paid at time of booking and is returned within 14 days after departure following inspection. Discounts are offered for longer bookings, contact owner for information. A cleaning fee of 70 euros is paid locally after arrival to ensure the apartment is always cleaned and maintained to the highest standard for guest arrivals.